Since they formed in 2009, Americana trio The Boxcar Lilies have been wowing audiences with their standout marriage of superb songwriting and spine-tingling, innovative harmonies. In a short time, they’ve garnered an exceptional amount of attention for their music and energetic stage presence, finding themselves playing renowned venues like The Iron Horse Music Hall (Northampton, MA) and Philadelphia’s Tin Angel, or opening for legendary songwriters like Bill Staines and Lucy Kaplansky. Based in the Pioneer Valley of Western Massachusetts, The Boxcar Lilies are Jenny Goodspeed, Stephanie Marshall, and Katie Clarke. Each an accomplished singer-songwriter in her own right, they married their love (read: obsession) for great songwriting and heavenly harmonies and in 2011 released their debut CD Heartwood (from The Boxcar Lilies ReverbNation page. I hesitate, strongly, to compare The Boxcar Lilies to The Dixie Chicks because I don’t know if they’d like that, but I’m going to do it anyway. The Dixie Chicks are well-known for their lyrics and harmony. The harmony and lyrics of The Boxcar Lilies is absolutely top-notch. The band labels themselves Americana, Folk, and Acoustic. If you aren’t familiar with Americana, it’s a mix of Country, Bluegrass, Folk, Gospel, and Rock, among a few other genres. The Boxcar Lilies have a lot to be proud of. First and foremost the band contains three extremely talented singers. And just being a good singer doesn’t mean that you’ll work well with others, but when these ladies start to harmonize, holy jumpin’, it is a real treat. It’s like they all share one mind while playing their songs and then those three voices meld into one voice and it’s simply amazing. Similar to The Glass Child, The Boxcar Lilies’ lyrics are deep, soulful, and intelligent. A song from Boxcar Lilies is like a musical story, complete with banjo, fiddle, ukulele, mandolin, and acoustic guitar. And that’s another thing this group has going for them – musical talent. These aren’t just simple songs with simple chords. There is a ton of talent in not only the playing of the music on various instruments, but in the composition of the songs as well. It is always refreshing to find music that is both a pleasure to listen to and to try to understand on a deeper level. 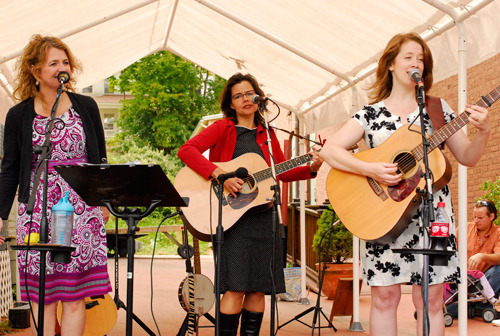 If Americana is your thing then look no further than The Boxcar Lilies. A breath of harmony-filled fresh air. Boxcar Lilies are the real deal. Three talented musicians with 3 diverse styles – country-rock (Stephanie Marshall), traditional bluegrass (Katie Clarke), and folk singer songwriter (Jenny Goodspeed). Together, these Lilies sound like a choir of angels with their 3-part harmonies. But don’t take my word for it. Check out the Boxcar Lilies!